UPDATED: Now with script! Also I’ve reworked some of the text to take this into account – (text in green is new) It’s been pointed out that this post deals more firmly with STORYTELLING rather than composition – which is true, though I think, when it comes to comics the storytelling elements – time and how the comic is read, IS part of the composition of the whole piece. I’ve never really understood composition. I’ve seen lots and lots of books on the topic, and various images broken down into constituent parts (with lots of references to golden means, triangles and other things) but I’ve never really -if you’ll forgive the phrase- grokked it. Which, as you can probably imagine, is a major problem when you make your living from drawing. Being of a fairly analytical mind, though, I have replaced the whole concept of ‘composition’ with the idea of panels as puzzles. Each panel has certain key bits of information that you, as the artist, have to convey. The writer will let you know what they are and you have to do your damn best to work that out and figure out how to tell the reader the same information – but with pictures. So, to that end, I’m gonna give you my thoughts on a page of the recent Dredd “Dragon’s Den” – written by Gordon Rennie. Ok, first thing to note, is that Gordon tends to write in two page chunks. There is ALWAYS at least one very clear scene change within that two pages (and you want, as best as possible, to turn a page onto a scene change – or, rather, you want to avoid changing a scene mid page). In this case, I saw the the last panel – as being a logical place to put a splash page, it would give plenty of room for what was required, but, more importantly, a splash page would give a large dramatic impact on the reader (part of the problem: how do I make this BIG shot look impressive? answer: use the entire page). As it happened, I ended up with a second splash page in this Dredd – which, ordinarily, would be two splash pages more than usual for Dredd – but both really served the story well (the second splash was Dredd dressed in a Knight’s armour assembled from various 21st Century detritus). Third reading of the script, I note the number of panels at the top of each scripted page – page 1 would have 8 (yikes! still, 2000AD pages are big) and page 2 would have 1. Thumbnails. I start looking at the script while doodling the thumbnails – the panel count guides me, as well as the amount of dialogue/captions – they shape the size of the panels. Then I have to figure out what else is in the panel. The image below ISN’T the thumbnails – rather it’s the page reduced and simplified to only show panels – which is one element of the thumb nailing stage. What’s immediately apparant in this is that panel 1 has more dialogue than panels 2-4, and the panels shrink in size as they zoom in closer on the detail. Let’s look at Panels 1-4 in some ridiculous levels of details. 1. INT. SOME SHELTERED PLACE IN THE RUBBLE – NIGHT. DREDD, injured and bandaged-up is lying back against a wall, in the shadows, while FELIX dumps a bunch of burned-up Lawmaster junk onto a larger pile of the same. THAT’S THE LAST OF IT. EVERYTHING I COULD SCAVENGE FROM THE REMAINS OF THOSE TWO JUDGE BIKES, THAT AIN’T ALREADY ALL BURNED UP. SO WHAT AM I SUPPOSED TO BE LOOKING FOR? 2. Dredd, in the shadows, working on something he’s holding. WEAPONS. AMMO. MED SUPPLIES. RADIO PARTS. ANYTHING I CAN USE TO GET BACK INTO THE FIGHT. THE FIGHT? YOU AIN’T THINKING ABOUT TAKING THAT THING ON AGAIN, ARE YOU? 3. On Dredd. He’s holding his helmet, and working on it with some small tools. Now we know why he’s sitting back in the shadows where we can’t see his face. HELMET RADIO’S BUSTED, BUT IT’S PICKING UP AN ACTIVE VOICE SIGNAL FROM SOMEWHERE NEARBY. THAT MEANS MACKMAN’S ALIVE. I NEED TO ARM UP AND GO FIND HIM. 4. In close on the helmet. LETTERING – big speech balloon, lots of empty white space, with tiny indistinct lettering in it. Someone’s on the radio and talking, but the signal’s so weak, we can’t hear it. As described in the script, it would be perfectly legitimate to draw each panel at very different angles – panel 1 birds eye view, panel 2 eye level, panel 3 worms eye view, panel 4 extreme closeup. BUT that means every panel is fighting against the next/previous panel – all of them vying for your immediate attention. When it’s far more sensible (not to say obvious) that if they’re treated as a series of closeups, each getting nearer and nearer to the helmet then the storytelling is on the readers side rather than trying to make a fuss of itself. 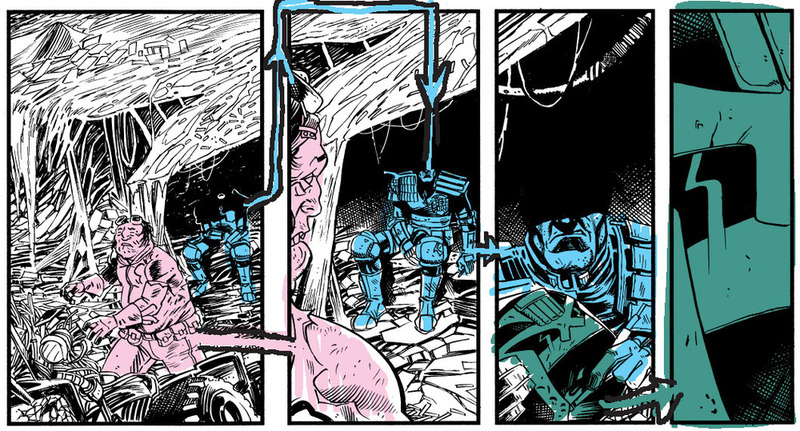 Panel 1 is, in reality an establishing shot, but doesn’t really show much detail – there’s plenty of rubble so we get the sense that the Mutant (foreground dude with goggles on his head) is somewhere inside some rubble (this scene is set deep within the bowls of an old Mall in the Cursed Earth). Dredd’s bike is there (destroyed in the previous episode and in the foregroun)- if you know what you’re looking for, otherwise it’s just more rubble. Dredd is sitting deeply in shadow (all shots of Dredd without his helmet require Dredd to be sitting in shadow!). The rubble that frames Dredd and the subsequent deep shadow, makes sure that he doesn’t get too lost in the details. Panel 3 we’ve moved tighter on Dredd – the continuity here is Dredd’s own face – heavily shadowed previously, the shadow is carried through and ties panels 2&3 together. He’s working now on the helmet mic – which is why, in the previous panel, I had Dredd pick up a tool kit. Panel 4 tight shot on the helmet – I really should have included a little bit of the ‘screwdriver’ (or whatever it is Dredd is holding) to make sure you know that this is still the same helmet. But I think it still holds together. I think, the important thing is we read let to right, but only when there’s something to “read” – failing that we go searching for something of interest. In the case of panel one, my eyes scan down until we get to the mutant, whereupon I read and move towards Dredd. Panel two, I think, naturally, I follow the eyeline of the mutant to Dredd (and I read his body and end at the knee – oddly). Panel 3 focus goes from Dredd’s chin to the bit of the Helmet he’s working on. And Panel 4 doesn’t really force the reader to any particular point – save around the mask – below the “S” shape (whereupon they’ll be met by the dialogue). 5. Cut to extreme close-up of MACKMAN, talking into his helmet radio. We’re hearing now the words that we couldn’t hear in the last panel. DREDD – MACKMAN. YOU READING THIS, DREDD? IF YOU’RE THERE, COME BACK AND COPY. 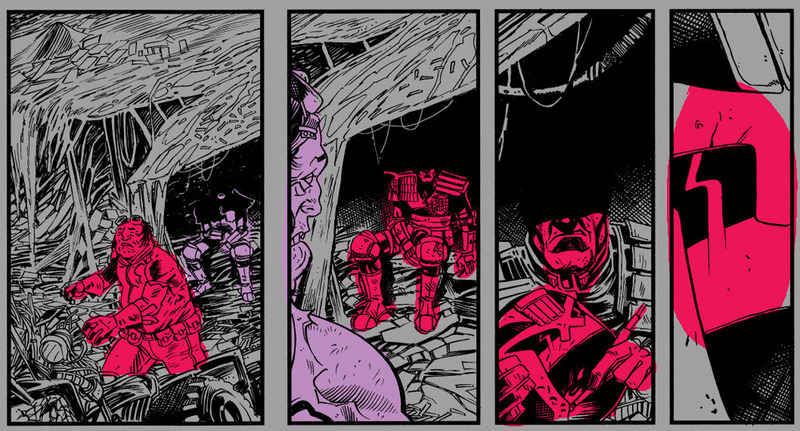 Panel 5 is Judge MACKMAN talking to Dredd, at this point the dialogue is holding the story telling elements together – The helmet from the previous panel visually links to this panel (as Gordon has in the script). The dialogue confirms this is a different judge in a different location (though, I hope, that is also clear from the art). I quite like that the widescreen panel is a change of tempo from the previous panels and it helps to establish a change of scene. 6. Pulling back to see Mackman’s situation. He’s lying in some dug-up crater, similar to a very large reptile’s nest. He’s clearly badly injured from the injuries he received last episode, but has managed to scramble halfway up the slope of the crater. OKAY, SITREP HERE’S NOT GOOD. I’M INJURED AND UNABLE TO MOVE MUCH, AND IN WHAT APPEARS TO BE THE CREATURE’S NEST. THE GOOD NEWS IS, THERE ONLY APPEARS TO BE ONE OF THESE THINGS AROUND. THE BAD NEWS IS, I DON’T THINK THAT SITUATION’S GOING TO LAST MUCH LONGER. 8. Mackman, painfully crawling up the slope, trying to get out of the nest. GOT A BAD FEELING ABOUT WHY THAT THING’S KEPT ME ALIVE THIS LONG. IF YOU’RE PICKING THIS UP, GET HERE AS SOON AS YOU CAN. As scripted Panels 7 and 8 should be a slow pull out – but I thought a more interesting way to show this was to have them as a single wide panel that would be split with a gutter – an effect that’s only really possible in comics – we get the wide screen shot, the sense of place and connection between the two panels, plus the gutter serves as a way of putting emphasis on one moment and then the next. 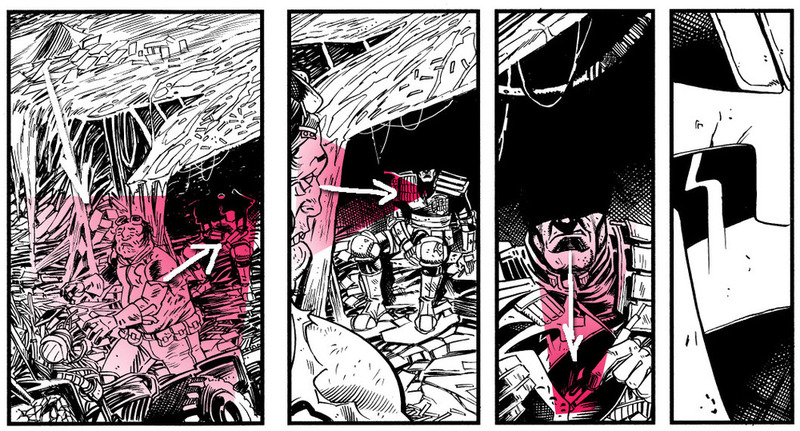 Panel 8 is the same thing from a different angle as the Judge attempts an escape – making sure to get the badge in can be an important story telling in Dredd’s world (if done subtly!) as it’s often the only way to tell one judge from another (unless you start resorting to facial hair or tattoos!) The background detritus is flowing in a different direction here which is a subtle cue that we’re looking at the same thing from a different angle. 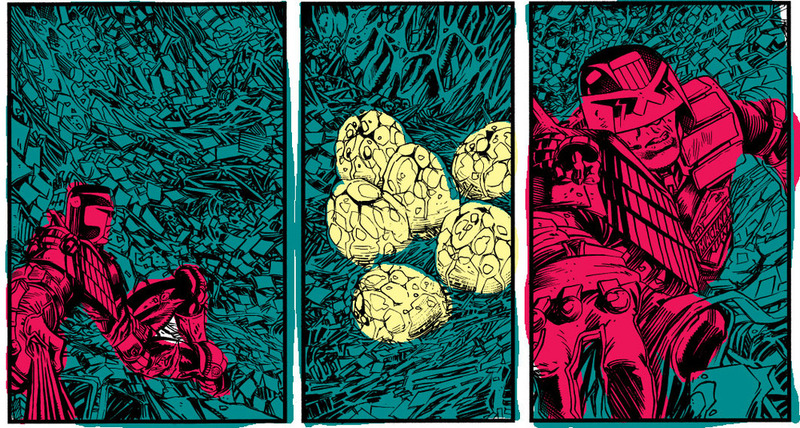 And, finally, the visual continuity tying those three panels together – looking back, I wish I’d been able to get even a glimpse of those eggs on panel 8 – to help the flow of story telling. Still, the background – to paraphrase the dude – really ties the room together. 9. Big shot, showing the whole of the underground cavern where the dragon has made its lair. It’s some kind of Pre-Atomic Wars place – the semi-collapses ruins of an old subway station or underground shopping mall? – and the walls glitter with precious old Pre-Atomic wars junk. There’s also piles of the stuff – all of it priceless – lying around the place. It’s very much the Cursed Earth version of a dragon’s treasure cave. THOSE STORIES ABOUT A DRAGON’S TREASURE HOARD MUST BE TRUE, AFTER ALL. THERE’S MAYBE ENOUGH VALUABLE PRE-ATOMIC WARS JUNK HERE TO PAY HALF THE CITY’S WELFARE BUDGET FOR THE NEXT YEAR! The rubble is a sort of abstract representation of rubble, making little actual sense – these aren’t real things that I’ve drawn, rather odd little abstract shapes in sizes and shapes that help suggest detail/distance and direction. It’s also (as can be seen in panel 7) a great way to pull the readers eyes in certain directions. A) How can I get all this dialogue in. B) What’s the bare minimum I need to draw to convey the information that’s required of me. C) Now that I’ve figured that out, how can i make this panel/post look more dramatic/interesting and tie into every panel on the page. When considered like that, the process is about solving a puzzle. How do I make it look like the character is in serious peril? 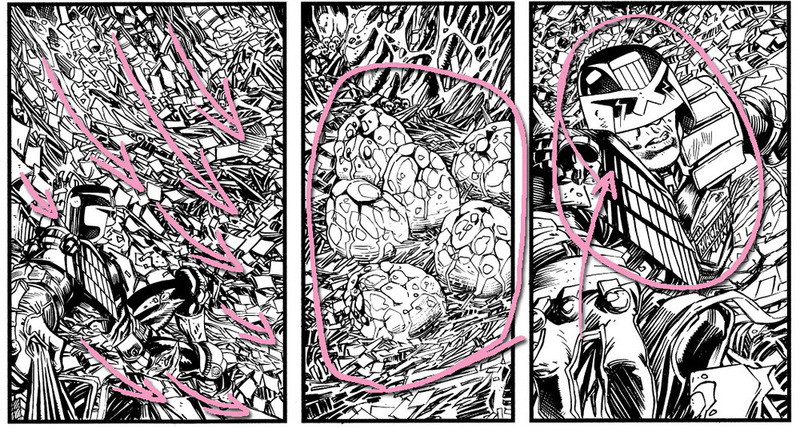 How do I highlight these eggs? How do I make the character look resolved into stoic action? And how do I tie those things all together and make it look cool…? Though I do that for each panel, I do it while considering the page as a whole (which is why small thumbnails are of use). So, that’s one page. Let me know if you have any comments/questions! Fantastic PJ, a fascinating read! You’re so generous with your time doing stuff like this, thanks a lot! Agreed! VERY generous. Thanks PJ. Excellent stuff. Thanks for this! Just what the doctor ordered, I so do enjoy watching/learning from your process 🙂 Thank you!